Bend Tech, the OSU-Cascades Co-Lab, and the law firm of Holley & Menker, P.A. 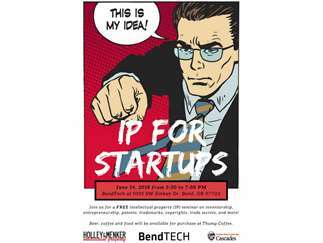 are hosting a FREE seminar in Bend to teach startups and inventors about intellectual property (IP). •	How do I know when I should file IP? •	Is it okay to talk to investors about my technology? •	How much protection can I get from a provisional patent? •	Do I need an IP attorney to help me or can I do this myself? Drew Smith of the law firm of Holley & Menker, P.A. will lead the discussion.